Be it while throwing a party or making a chilled drink for yourself, an ice maker always comes in handy. If you are looking for an ice maker that produces excellent ice cubes, you have come to the right place. Just make sure to read till the very end to know exactly what meets all your requirements. With the market flooded with options, choosing a good ice maker isn’t easy. There are ice makers available in all sizes and in all price points. There are ice makers for those who need ice just here and there and also for those who need ice to be produced all day. In this article, we have made a list of four Best Countertop/Portable Ice Maker choices which meet the needs of most people. So, let’s dive into them. If you are looking for an entry-level Ice Maker, the Igloo ICE103 Counter Top Ice Maker is your best bet. It has a production capacity of 26 lbs of ice and storage capacity of 2.2 lbs. While the production capacity is on par to the competition, the storage capacity is undoubtedly much better than the competition. Further, the ice maker is also capable of producing ice in 3 different sizes. However, you can’t select ice shapes like in other higher-end machines. The first batch of ice is produced in around 8 minutes. The newer batch is produced in a shorter time after the machine reaches a temperature below the room temperature. There are sensors on the Igloo ICE103 Ice Maker which lets you know when you have run out of the water and also lets you know when the ice container is full. However, we had experienced instances where the sensors failed to work. Also, keep in mind that this ice maker is not a freezer. So, if you don’t transfer the ice to the freezer in time, the ice melts which later gives out a bad odor. This ice maker can produce up to 28 lbs of ice per day and can store 1.6 lbs of ice in its storage bucket. Once the storage bucket is full, the machine will stop producing the ice automatically. You can also configure the machine to produce either small, medium or large sized ice cubes. 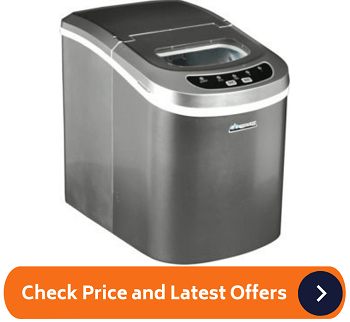 The NewAir AI-100R Ice Maker is one of the quietest machines you will find in this price point. Apart from the almost-silent spinning noise of the fan, the only noise this machine produces is the sound of the ice cubes clinking into the basket and the sound of the water dripping. It is quite compact and can fit neatly on a counter or tabletop without occupying much space. It’s also available in 6 colors so color option definitely isn’t going to be your concern. The NewAir AI-100R is ideal for parties, picnics, barbecues and for regular use. Thanks to the lightweight construction, it is also quite portable. Setting up the machine is just as easy. Plug it into the power outlet, fill the tank and with a press of a button, you are all set for the first batch of the ice cube. What’s also not going to be much of a concern is the maintenance of the machine. With the side mounted drain, cleaning it up is an easy affair. If you want a no-nonsense ice maker that produces good-quality ice cubes, the Avalon Bay AB-ICE6S Portable Ice Maker is the one to go for. It produces ice cubes in under 7 minutes and can produce 26 pounds of ice a day. 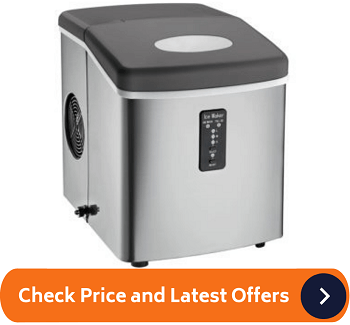 This ice maker is compact and is suited for those who are always on the move. Priced at under $150, it’s also really good value for money. The machine is capable of producing ice cubes in two different sizes: Medium and Large. There are also sensors which stops the system automatically when either the ice cube container is full or when the water reservoir is empty. As with other ice makers in the list, be warned that the ice will melt if you don’t transfer the ice to the freezer. Even when the ice maker is on, after a few hours, the ice starts to melt. So, it’s best not to store the ice on the ice maker for a long time. Unfortunately, this ice maker isn’t very quiet. We found the competing models produced a lot less noise while producing ice cubes. We have saved the best for the last. For the money, it’s really hard to beat the Della Stainless Steel Ice Maker. It is able to produce up to 48 lbs ice cube per day and can produce the first batch of the ice cube in under 6 minutes. The ice maker has a compact design and suites well in a medium-sized kitchen. It’s also suited well for picnics, parties, and barbecues. The device is plug and play which means there’s no installation process involved. Just connect the ice maker to the outlet, fill in the water and with a touch of a button, the machine starts making ice cubes. 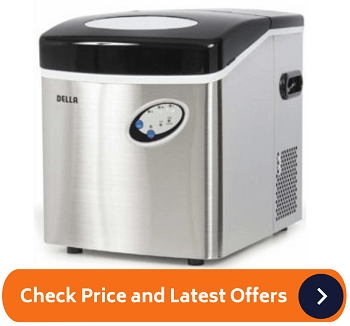 The Della Stainless Steel Ice Maker can produce either small, medium or large ice cubes. On a single cycle, it produces 12 pieces of ice. The ice is stored in an insulated storage bin which maintains the temperature much better than other ice makers. It is a small but really valuable addition. The build and finish of the ice maker are also top-notch. Not only does this particular ice maker function well, it looks just as good. There are tons of Ice Makers out there and finding a perfect one is quite a daunting task. Trust me, there’s no such thing as a perfect Ice Maker. What you should look for instead is an ice maker that meets all your requirements. It is basically the ice production capacity of the machine in a 24-hour period. You will find that the production capacity is usually measured in pounds. If an ice maker is rated at 24 lbs production capacity, it means that it is capable of producing up to 24 lbs of ice cubes a day. However, keep in mind that the production capacity is only obtained in ideal condition. Just like automobile mpg rating, chances are, you will never hit get claimed figures. If you are a family of two or want an ice maker all for yourself, getting a 20 lbs capacity ice maker is going to be just fine. If you have got a family with 4-5 members, you should be looking at 24lbs-26lbs production capacity ice-maker. You will find most of the ice makers come with 26 lbs capacity. If you are looking for something larger, you will have to upgrade to under-counter ice makers which can produce 30 lbs all the way up to 50 lbs of ice per day. The production capacity of an ice maker is clearly stated in the specification sheet. It is the first thing you should look at while buying an ice maker. If you were under an assumption that production and storage capacity is the same thing, you would be very wrong. The amount of ice an ice maker can produce in a day is its production capacity. The amount it can hold in the supplied tray or bucket is its storage capacity. This is an important factor which determines how much ice is produced and stored per cycle. The storage capacity varies. You will find that small ice maker can produce 1.5 lbs of ice before the storage capacity is reached. But larger portable ice makers can store up to 2.5 lbs of ice before the bucket is filled out. All the modern ice makers have sensors in them which automatically stop production of ice when the storage capacity is reached. So, you really don’t need to worry about overflowing of ice. Ice makers that you find in the market today are very user-friendly and work with little user input. But that is after the installation of the machines themselves. The installation of under-counter and built-in ice makers may require plumbing and supervision of a professional in order to get everything to work correctly. However, if it is a crushed ice machine you are planning to buy, you will be glad to know that there’s really no installation required. You simply plug in the device to the outlet, add in water in the tank and switch it on. Spending more money doesn’t always translate into higher satisfaction. In fact, if you are not well aware of your purchase, chances are, you will remorse later. You will find a lot of ice makers priced between $100-$200 and we believe that $200 is the sweet spot for such a machine. Keep in mind though, if you are looking for a fixed ice maker that is as large as your washing machine, you may need to spend as much as $500. As with most of the electrical appliances, you will find that most of the ice makers will come with a 1-year limited warranty. A few of the brands (usually those who don’t have confidence in their own products) will offer a warranty of 6 months or even less. It’s best if you avoid them. 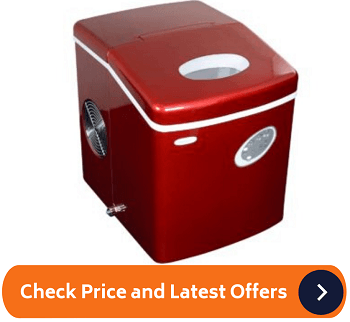 How to Setup and Maintain your Portable Ice Maker? Buying a Countertop ice maker not only saves you a lot of money, it also saves you from a lot of maintenance headache. For the first couple of years, the only maintenance ice makers require is periodic cleaning. You will want to do it to avoid smelly ice which tastes stale. The other reason why you may want to periodically clean the system is to make sure that you clean away any mineral or other particles in the water which may ultimately block the circulation system leading to system failure. Disconnect the ice maker from the source. This should be the first step while performing maintenance not only ice maker but any other electrical appliance. Remove any ice that is left in the bucket or the tray. Also, clear the water from the reservoir. Remove parts easily removable by the user such as a bucket or a storage tray. Clean the tray with soap and scrub off any underlying impurities. Clean the system with a soft cloth. If you think there are impurities in the system, soak the cloth in water and add a few drops of vinegar to it and clean the inside of the ice maker. Put the tray or the bucket back into the system. Let the system dry completely before plugging it into the outlet. Fill the reservoir with water mixed with lemon juice and vinegar. You can alternatively mix water with ice machine cleaner which can be found in a majority of supermarkets. Connect the machine to the power source. Produce multiple batches of ice cubes and discard them. Finally, add warm water to the reservoir and produce a batch of ice cube and discard it. It will remove the taste of both lemon and vinegar from the system.